A chaplaincy service is available on an on-call basis 24 hours a day. Our Chaplains represent the denominations of the free Church and Roman Catholicism. They can also arrange for representatives of other faiths to visit you too; simply contact them and ask. The chaplaincy service is available to anyone from any faith or no faith. You may wish to talk to someone about faith, have questions about life, have a deep feeling of numbness or isolation or your life may have been turned upside down. Everyone is welcome to contact us. If you’re staying here as a patient, please ask a member of the Nursing team to contact a Chaplain. They will contact the main switchboard and arrange a visit. I am a British Citizen, originally from Nigeria. I professed as a Roman Catholic Nun in 1996. I worked as the assistant Roman Catholic Chaplin at Liverpool Royal Hospital Trust before moving to the Royal Orthopaedic Hospital in 2011. I have found peace and joy in my work and I am passionate about bringing spiritual and emotional support to the patients, families and staff at the hospital. I have trained in PGC in Chaplaincy and experienced in pastoral spiritual support, religious care and counsel. I am an Ordained Minister in the Free Church. Before my ordination in 2007, I was a teacher and then a youth and community leader. In 1967, I became a Christian and since then, my own physical pain and life experiences have shaped a deep trust in a loving God. I am a part-time Honorary Chaplain at the Royal Orthopaedic Hospital Trust. Our dedicated Prayer Room is located opposite Ward 1 on the ground floor. 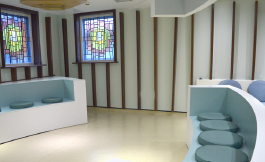 The Prayer room is always accessible so patients and visitors are welcome to use it whenever they like. It contains various aids to religious practice as well as a Muslim wash area.